Chemistry experiments for high school don't have to be complicated. The following projects use materials that are easy to acquire, but are definitely high school level chemistry experiments. If you need help downloading any of the printable projects, check out these helpful tips. Click to print this project. In this lab, you're going to explore the solubility of three solutes, as well as the electrical conductivity of three solutions. It's important to know before doing your lab that water is a polar molecule, while another substance you're testing, xylene, is a non-polar molecule. Polar molecules will dissolve ionic compounds and some molecular compounds that have polar, covalent bonds. However, non-polar molecules will dissolve non-polar molecules that have non-polar covalent bonds. On the other hand, alcohol has varied ability to dissolve substances. It is said to show "intermediate polarity." Solubility - A substance is said to be 'soluble' if it can dissolve in a particular substance. The quality of it doing so is its solubility. For example, salt is soluble in water. Oil is insoluble. Solute - A solute is the substance being dissolved. Solvent - A solvent is the substance in which something is dissolved in (like water). Nonpolar molecules - Molecules that arrange symmetrically such that there is not a positive nor a negative charge. Click to print the following lab, and follow the directions exactly. Record in your lab notebook all of your observations. Based on your lab results, make a short list of types of things each solvent could possibly clean. Think about common household cleaners like Windex. Why does your window cleaner need to be alcohol-based? Why do bakers often use non-stick cooking spray? You have probably already seen the freezing point of water lowered before. If you've ever seen trucks put out salt before a big, winter storm, you've seen chemistry in action. Salt lowers the freezing point of water, thereby making the temperature at which it freezes higher and, of course, roads much safer. 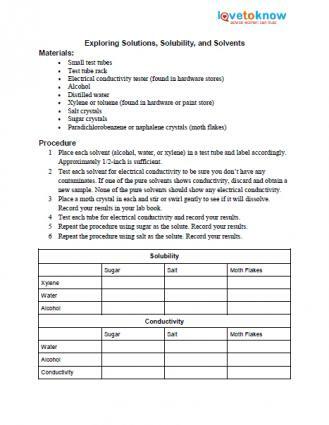 In this project, you'll calculate the molality and test the freezing point of three beakers of salt/water solution and three beakers of sucrose/water solution. Then, you'll figure out the freezing point depression - or how the solution is affected by its solute. Click to print out the lab procedure. Follow the directions exactly and make careful notes in your lab notebook. 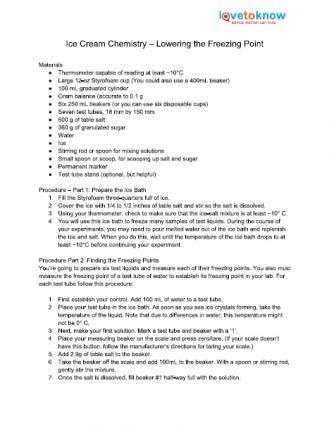 Make sure as you go along to write down the freezing point for each of your solutions, including the beaker of plain water, which in this lab is your control. Next, find the number of moles of solute for each of your solutions. Note that the number of moles of a substance is defined as the weight of the substance (in g) divided by the gram molecular weight of the substance. The molecular weight of salt is 58.443 g, and the molecular weight of sucrose is 342.3 g. Note that the molecular weight of 100mL of water is .1kg. Next, calculate the molality which is moles of solute per kg of solvent. Note how the molalities of the salt/water solutions and sucrose/water solutions compare. Next, calculate the expected freezing point depression using the formula above for ΔT. How do your calculations compare with what you actually observed? Can you come up with a statement that expresses a causal relationship between the molality of a solution and its freezing point depression? Sodium acetate (one of the products of a baking soda and vinegar mixture) has a unique property in that it is capable of freezing without actually being freezing in temperature. In fact, when this substance freezes, it actually gets hotter rather than cooler. Hot ice is a great experiment if you're going for the wow factor. However, it definitely takes a certain amount of finesse to do it right. Don't be surprised if you have to try it a few times before you get it to work. Hot ice (freezing sodium acetate) is an exothermic reaction - meaning that as the sodium acetate 'freezes' the substance gives off heat. In fact, it is the same type of chemical reaction used in MREs, hand warmers and similar products. Sodium acetate is one of the by-products of baking soda and vinegar. The formula for the reaction is as follows: Na+[HCO3]- + CH3-COOH → CH3-COO- Na+ + H2O + CO2. Click to print the lab procedure to the right. 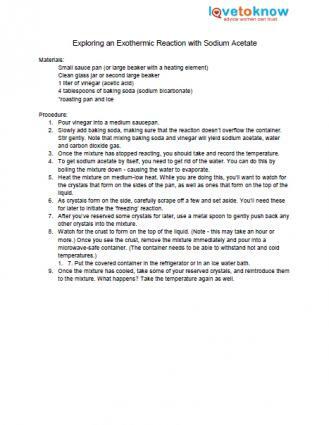 While making hot ice is relatively safe (the chemical itself is non-toxic), caution should be used whenever you are handling hot substances. Make sure to note the temperatures of the sodium acetate as you move through the experiment. The important thing to notice is the supercooled liquid (liquid that is cooled below its melting point), and the exothermic reaction that you get when you reintroduce a crystal to the solution. The crystal acts as a nucleation site. You can make hot ice sculptures by introducing a crystal as you pour. When you do this, what is the temperature of the hot ice? Remember that when you're working with chemicals, even ones that you think are safe, you should always use safety goggles, and perhaps protective gloves. It's important to get into the habit of using safety equipment so that it is automatic. Remember as well, that when you are working over a stove, you should always wear oven mitts or use tongs. Common sense in the lab goes a long way toward an enjoyable experience.